More than 3,500 years after the pyramids were built in Egypt, the desert sled finally gets its comeback - not as a means of transport, but as a piece of sporting equipment. First there was sand skiing and sandboarding on hot quartz sand, then came the innovation of tobogganing parties by enormous sand dunes. 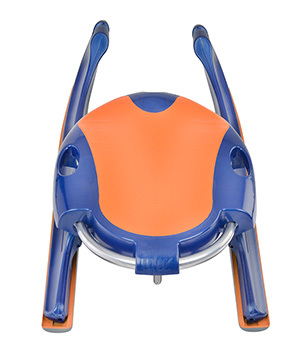 The manufacturer of the innovative piece of sporting equipment is KHW, based in Geschwenda, who have been the world leaders in the production of leisure plastic sleds since the '90s. The innovative aspects of the bioplastic sled are the particularly low-abrasion runners and modified design. Scientists at Ilmenau University of Technology and the Franhofer Institute UMSICHT in Oberhausen were the research partners for this project. The sled itself was tested in Namibia - by a Thuringian in fact, who runs the world's first sand skiing school there. Henrik’s pleasure in skiing moved him to adapt ski sports in deserts and brought sandskiing to a new level.